Intellectual property refers to things or processes our minds create, as well as symbols, names, and images. Things our minds create include works of literature, art music and inventions, while symbols could be company logos, trademarks, and slogans. Intellectual property is divided into two separate categories: 1. Copyright and, 2. Industrial Property. Works of literature, such as plays, poems, news articles and novels. Films and movies, including the famous Hollywood films, as well as TV adverts, TV shows, soaps and documentaries. Works of art, such as sculptures, paintings, photographs, melodies, songs and architectural designs. Trademarks, such as the names Google, Microsoft, and AT&T. The word ‘Coke’ has been a registered trademark of the Coca-Cola Company since March 27th, 1944. ‘Fanta’ and ‘Sprite’ are also trademarks of the Coca-Cola company. ‘Coca-Cola’ is also a trademark. Patent protection stops others from stealing your invention. Patents protect new inventions and cover how they work, what they do and how they do it, what their components are (what they are made of), and how they are made. If an inventor is granted a patent, he or she has the legal right to take action under civil law to block others from selling the invention, using it, or making things using the invention without permission. Patents do not include discoveries, they only apply to something that did not exist before. For example, if you are a scientists and discover a new element, that is not an invention, it was already there, therefore that element cannot be patented. However, if you invented the means of discovering that element, you might be able to patent that means if it never existed before. In most countries a patent is valid for twenty years. The term Intellectual Property Rights simply refers to the acknowledgement and protection of intellectual property if it is properly registered. For example, writers, musicians and artists are protected by copyright for a period of 50 years after their death. Thousands of pediatric patients have benefited from intellectual property rights in just one hospital. The children’s fairy tale “Peter Pan” was written by Scottish playwright and novelist J.M. Barrie (1860-1937). 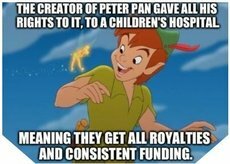 Before he died he gave the rights of the Peter Pan works to Great Ormond Street Hospital in London, a children’s hospital, which has benefited enormously. Without intellectual property rights it is doubtful that 95% of pharmaceutical drugs or vaccines would exist today. A new drug is usually on the market after several years of research and development, followed by animal and then human clinical trials. Without intellectual property rights, many drugs would probably have never been created. By the time the new medication or vaccine is approved tens of millions of dollars have been spent on that new medication with absolutely no income, plus tens and possibly hundreds of millions of dollars on other molecules that never made it to the market. Most pharmaceutical drugs reach the market between 8 and 11 years into their 20-year patent life. So, they only have about ten years before their patent life expires and competitors can come in selling generic forms. If intellectual property rights did not exist, drug companies would not carry out any research and then trials into new medications. The same applies to hundreds of different types of companies. Intellectual property rights are crucial for scientific and commercial innovation. If intellectual property rights did not exist, consumers would have no guarantee that what they were buying was really authentic. A client paying for a new Mercedes could never be completely sure that he or she was not buying a fake or copycat product. The speaker in this video uses the term IPR (intellectual property rights), which refers to patents, copyright, trademarks, industrial design rights, trade dress, and in some jurisdictions trade secrets.